It's definitely about the haze! Case in point, Sloop Brewing Company's Juice Bomb NE IPA. Hazy, golden and unfiltered. This Northeastern style IPA continues to be one of my favorite beers to both drink and brew. 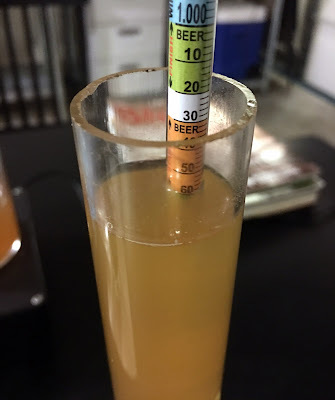 Over a five-month period, I managed to brew fifty gallons of what has become my favorite NE IPA recipe. Having this much beer on hand allowed me to share it with a very wide range of beer drinkers. Having sampled from several of my batches many commented on how much they like this beer. Including some who avoid IPAs because they find them to be undrinkable. While a small percentage did not care for this style the majority of beer drinkers liked it. Without a doubt, the 'Haze Craze' is a popular topic of conversation for craft beer enthusiasts. The style has generated a lot of questions and its fair share of controversy too. Tales about the rapid oxidation of NE IPAs soon after packaging are not uncommon. And the pains some brewers are taking to avoid it are astounding. But by following a few simple guidelines I have managed to avoid oxidation issues in any of my batches. The following information is a proven approach you can use to brew the ultimate Juice Bomb NE IPA clone. Any discussion of the NE IPA style eventually leads to the question of "what causes the haze to form?". While some brewers say they add raw flour to their beer to make it cloudy. In reality, the secret to brewing a juicy tasting beer with a long lasting haze comes down to two things. Biotransformations and permanent chill haze. The former describes the process of converting non-aromatic hop compounds into aromatic compounds. Aromas that include citrus pine and floral that would otherwise not be present. The later is a product of malt protein and hop polyphenols that cause a beer to form a haze at cold temperatures. It is worth noting that permanent chill haze is flavorless having no impact on beer taste. There are very good reasons not to add flour to a beer. Flour will make a beer cloudy, murky and opaque. But flour will not make a hazy beer. To me adding flour to a beer in an attempt to make it hazy is pretty much nothing more than a ruse. Adding flour to beer will make the beer murky and also introduce flavor and stability issues. Another thing to avoid is using a low flocculating strain of yeast. The cells of those strains will make your beer cloudy by staying in suspension longer. But they will also add a yeasty flavor profile that is uncharacteristic for a true NE IPA beer style. 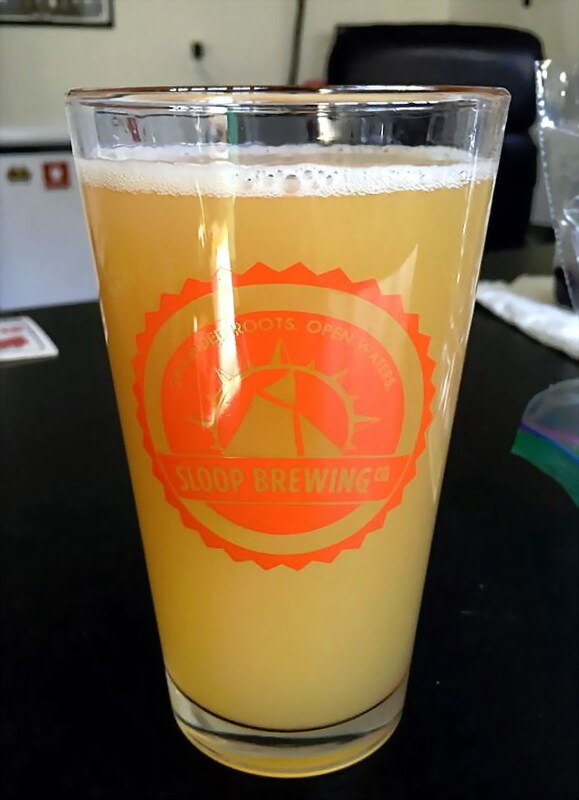 I first learned about Sloop Brewing Company and their Juice Bomb NE IPA at my daughter's wedding. It was the only IPA that Foxfire Mountain House had on tap at the time. Little did I know then but Zymurgy Magazine had published a Juice Bomb clone recipe in their May/June 2017 issue. In that same issue, Martin Brungard also had an article for creating the perfect NE IPA water profile! Coincidence? Or had the stars had aligned at the right moment in time? After rejecting the idea of brewing a hazy beer for months I finally relented. Hops are a major contributor to the appearance and taste of an NE IPA. Having the ability to whirlpool hops after flameout for an extended period of time is a must. Especially when it comes to juicing up aroma to NE IPA levels. Late boil, whirlpool, and dry hop additions each contribute a different aroma character. This recipe relies on whirlpool hops and dry hops for its aroma. At flameout whirlpool the hop addition until the wort temperature drops to [170 ° F/76 ° C]. When brewing a [10-gallon/38 L] batch this process takes approximately 45 minutes on my system. I realize not everyone brews 10-gallon batches on a 15-gallon BIAB system like I do. For convenience follow the link to ezRecipe "The easy way to awesome beer!" Use it as needed to adjust this recipe to work with your brewing system. ezRecipe is a 100% free full-featured recipe designer that is easy to learn and easy to use. And it's available now in both US and Metric versions. Remove the complexities of mash pH prediction once and for all. ezRecipe uses 100% pure reverse osmosis or distilled source water. No more struggling to interpret outdated or incomplete water reports. When preparing the wort mash the grains at 148 ° F [64 ° C] for 60 minutes. 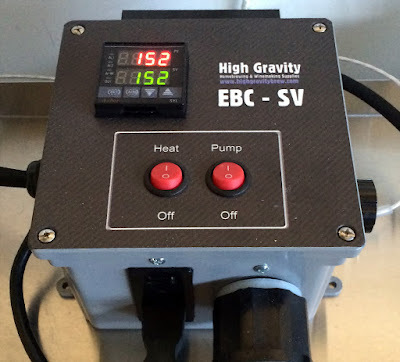 Using ezBIAB makes it easy to adjust the brewhouse settings to your own brewing system. My brewing system needs a 13.5-gallon [51-liter] pre-boil wort volume. A 11.75-gallon [44.5-liter] post boil wort volume. And a 12-gallon [45.5-liter] treated mash strike water volume. Remember to adjust the mash efficiency to match that of your brewing system. Targeting a 75% mash efficiency is a safe bet for most BIAB systems. Although after brewing several batches my results are a few percentage points higher. Ever since moving to a BIAB system I like to double crush my grain to increase mash efficiency. Crushing the grain no more than a day or two in advance will assure the most freshness. Giving the mash a good stir every 15 to 20 minutes will also help increase mash efficiency too. As far as adding an adjunct to increase the recipe's alcohol content I leave that up to the brewer to decide. If omitted the ABV of this recipe will be 5.8% instead of 6.5%. To me the increased alcohol content is a nice to have. It dries the beer a bit and adds what I perceive to be a subtle sweetness that works well with this beer style. Add the sugar to the wort while stirring with 10 minutes remaining to the boil and you're done. Filtering your reverse osmosis water the day before will save time on brewday. 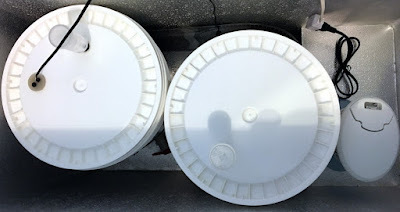 I store the water in a covered 15-gallon food grade tank overnight. The next morning I stir in the gypsum, calcium chloride, Epsom Salt and lactic acid additions. An hour or so later allowing time for the brewing water pH to stabilize I transfer the brewing water to the mash tun. My BIAB vessel is too small to hold the grains and brewing water at the same time. So I filter an extra 4-gallons [15.1-liters] of water to use for sparging the grains to hit the required pre-boil volume. The sparge water for this recipe doesn't need brewing salts or acid additions. 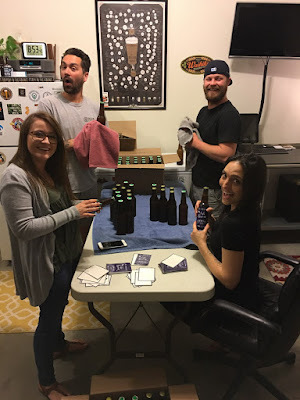 One of the goals when brewing a NE IPA is to cut out all harsh bitterness that's associated with an IPA style beer. The hop schedule and brewing water set this recipe apart from the typical IPA. Unlike the IPA style the majority of IBUs in a NE IPA come from late kettle hop additions and from dry hopping. While the NE IPA brewing water profile delivers a maltier character one not as harsh or bitter as an IPA. A single bitterness hop addition goes in at 30 minutes remaining to the boil and is removed at flameout. The whirlpool hops are then added and the wort circulated until the temperature falls to 170 ° F [76.5 ° C]. This takes about 45 minutes on my BIAB electric system. Remove all whirlpool hops once the wort cools down to [170 ° F/76 ° C]. Using a counter-flow chiller to cool the wort when filling the fermenters takes about 20 to 30 minutes. Once the airlock slows to 3 or 4 bubbles per minute its time to add the dry hops to the fermenters. 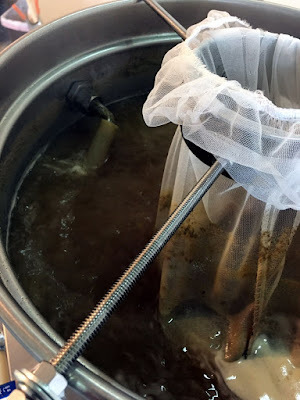 Put the dry hop additions in a weighted hop bag to keep them completely submerged in the fermenting beer. 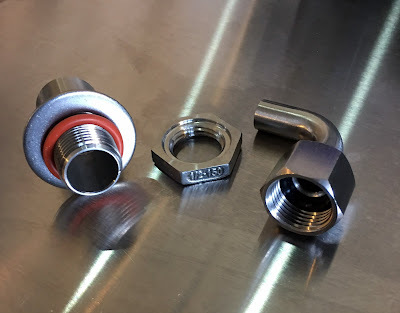 I use sanitized stainless steel bolts as weights with great results. When dry hopping the most recent batches I left the hops soaking in the fermenting beer for 7 days. The end result was an pleasant easy to drink beer loaded with juicy citrus flavor and aromas. 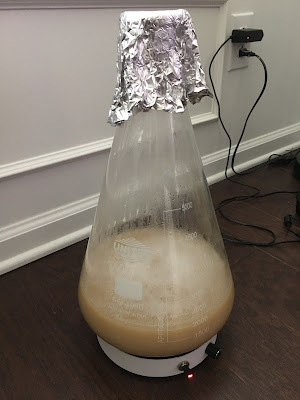 The recommended yeast for fermenting this recipe is White Labs - English Ale Yeast WLP002. A very high flocculation strain with medium attenuation. For best results make a yeast starter and pitch at a rate of 200 billion yeast cells per [5-gallons/19-liters] of beer. For a [10-gallon/38-liter] batch make a starter using [1-cup/180-grams] extra light dry malt extract in 2000-ml water. Into the room temperature wort pitch 2 - White Labs English Ale Yeast WLP002 pure pitch packets. Use a stirplate to keep the cells oxygenated until the starter reaches high krausen. After oxygenating the wort pitch the starter and ferment at [65 ° F/18.3 ° C] to reduce ester production. Starting on day 8 increase the fermentation temperature until it reaches [68 ° F/20 ° C] on day 12. Allow 2 days to cold crash the beer. Transfer to kegs and carbonate at 12-psi for one week before serving. Nothing brings people together better than enjoying a few delicious beers. Juice Bomb NE IPA is best enjoyed with friends and family alike. One thing is for sure. Once they've tried this beer they will always come back for more. So keep this recipe handy and be ready for the next time you're asked to brew a batch. 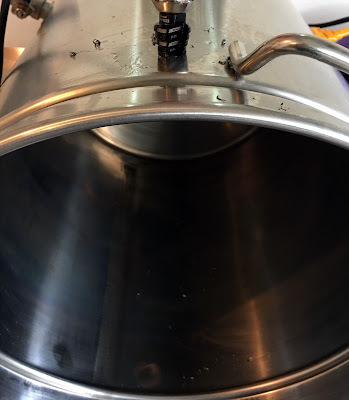 The thought of drilling a hole in your favorite boil kettle can be intimidating to most any homebrewer. Unless of course they have had some previous metal working experience, or they can enlist the help of someone having the skills needed. The more adventurous do-it-yourself types, those who have access to a variable speed drill and the right drill bits, can easily handle the task, along with the help of some PAM cooking spray for lubrication. The installation of the whirlpool port shown in this article, including setup and cleanup time, took about two hours. Allow yourself additional time to obtain the items listed below. Having all of the required parts in hand from the start, will allow you to successfully complete the project from beginning to end in just a few easy steps. Everything needed to successfully install the bulkhead fitting and whirlpool port were very easy to find online and they can be delivered to your door in under 5 days. Boiling wort is extremely hot and it has the potential to scald your skin in a matter of seconds. Coming into direct contact with boiling wort is also one of the most common causes of injury when brewing beer, something to keep in mind when working around it. Pumping boiling wort from the kettle, through a counter-flow chiller and then returning the wort to the kettle, is a very effective way to sanitizing the counter-flow chiller. Returning the hot wort exiting the chiller to the kettle, by using a clamp on the kettle rim to hold the end of a silicone hose in place, is not a safe. Temporary clamps can slip and move, causing a loose hose end to unexpectedly spray hot wort on brewers and equipment. 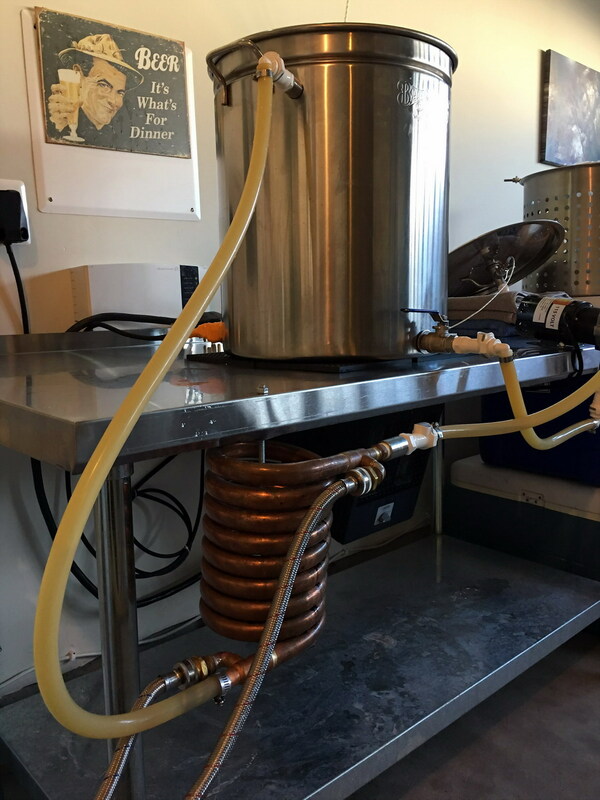 The safest way of returning hot wort to the kettle is through a permanently mounted whirlpool port. The use of a weldless whirlpool port ensures a solid physical connection between the kettle and the silicone tubing. 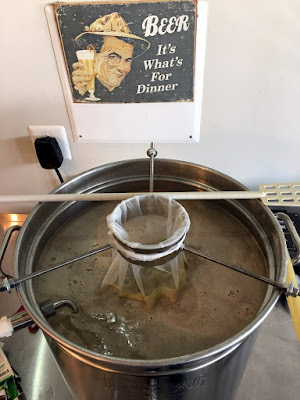 Once a solid connection has been made between the two, the risks of hot wort unintentionally splashing outside of the kettle are greatly reduced. Every successful project begins with a well thought out plan. Knowing exactly where to locate the whirlpool port before drilling a hole in the kettle is a must. The orientation of the port, its distance from the bottom of the kettle and how far it will extend inside the kettle, are all critical factors to be considered. Once a suitable location for the port has been found, that works with the size and dimension of the parts ordered, you are ready to drill the hole. 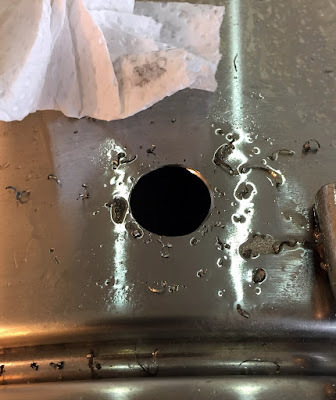 Turning the kettle on its side, laying it on a floor or other stable surface, and preventing it from moving as much as possible will make marking and drilling the hole much easier. Using a center punch, or a nail, mark the side of the kettle with a small 'X' to indicate where the center of the hole will be. Next use a hammer and nail to strike a dimple in the side of the kettle at the center of the 'X'. The dimple in the metal will prevent the drill bit from wandering away from the hole center when drilling. Spraying the hole center with PAM, or another food grade lubricant, will prevent the tip of the drill bit from burning up. Drilling holes in stainless steel requires a combination of steady pressure on the drill, slow bit rotation and plenty of lubrication to keep the tip of the drill bit cool and sharp. Center the tip of the 1/8 inch pilot bit into the dimple then trigger the drill on and off, using a slow drill speed while pressing firmly down on the drill. Expanding the pilot hole to the finished hole size is easy when using a high speed step bit. Once again, to prevent the bit from dulling use plenty of lubricant, trigger the drill at a slow rotation speed and apply a firm downward pressure on the drill. Keep in mind that using a step bit with a maximum hole diameter, that matches the diameter of the hole needed for the whirlpool port, eliminates the possibility of making the hole too big. Extra care should be taken, to prevent drilling a hole larger than needed, when using a larger diameter step bit. Debur the inside surface of the hole by running the drill from inside the kettle, lubricating the bit and rotating the bit at a slow speed. Again if using a larger diameter step bit be careful not to press too hard and make the hole any larger than needed. A small, fine, half round stainless steel file can also be used to debur the inside of the hole. Paper towels can then be used to wipe up any lubricant and metal shavings before installing the whirlpool port. The threads of the bulkhead fitting point inside the kettle. The orange silicone washer, with matching grooved nut, hold the fitting in place and seal the hole to eliminate leaks. The orange washer is squeezed, between shoulder of the stainless steel coupling on the outside, the kettle wall, and the grooved nut tightened against it on the inside of the kettle. Care should be taken when tightening the nut. 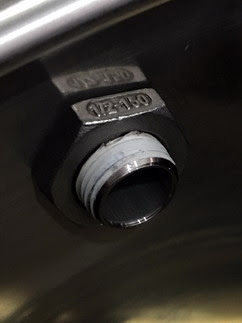 Over tightening the nut will push the soft silicone washer out from underneath the groove in the nut, and cause the bulkhead fitting to leak. After the mash has finished, and the grain basket has been removed from the kettle, the swivel dip tube is threaded onto the bulkhead fitting inside the kettle. 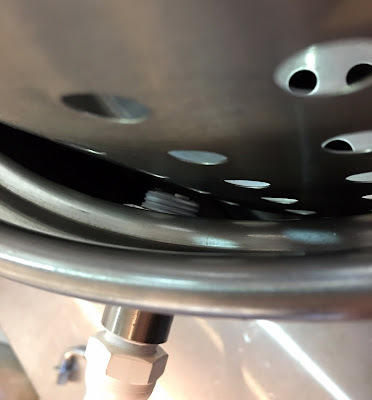 The swivel dip tube is removed during the mash, to provide the space needed between the inside of the kettle and the outside of the perforated grain basket. If the swivel tube is left on the bulkhead fitting the grain basket would not fit inside the kettle. 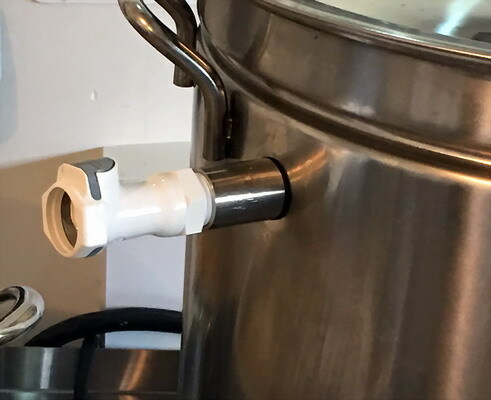 With the grain basket removed from the kettle the swivel dip tube can be threaded onto the bulkhead fitting and the wort brought to a boil. Pumping the boiling kettle wort through the counter-flow chiller and returning the wort to the kettle through the whirlpool port sanitizes the chiller while creating a strong whirlpool in the kettle. 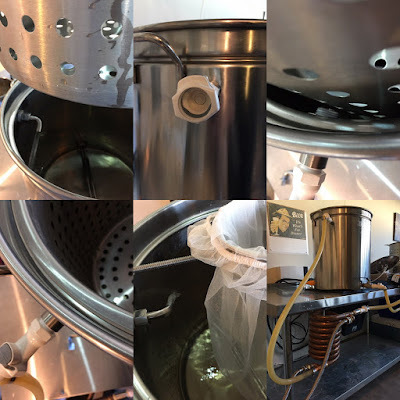 Increased hop utilization and greater hop isomerization is achieved when combining the whirlpool effect in the kettle with the use of a hop spider. And there you have it. With a bit of advanced planning, the correct parts and the right tools for the job, you too can successfully install a whirlpool port in any kettle. The benefits of a having a whirlpool port in your kettle are many. Increased safety, improved hop utilization, clearer wort and the ability to do whirlpool hopstands, these are just a few of the benefits. Another benefit worth mentioning is in knowing that you were able to successfully do-it-yourself. Add A Whirlpool Port And Brew Better Beer!